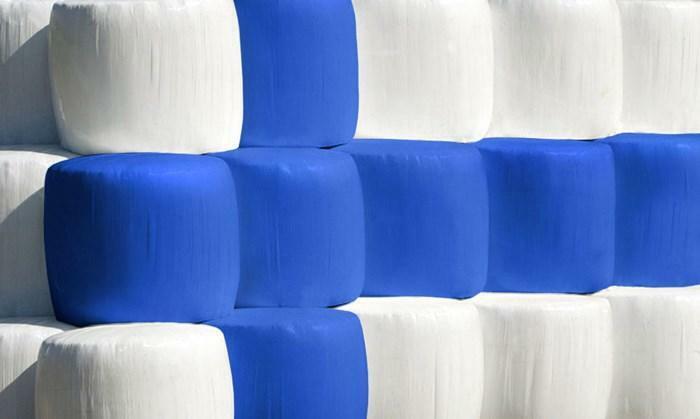 Rani Plast’s blue and white silage bales prove hugely popular. This spring and summer, Rani Plast is organising a photography competition of its Finland Bales together with Rautakesko. Rani Plast honours Finland’s centenary celebration by offering both blue and white stretch film for next summer’s silage bales. The campaign has been a great success, and the products have already been delivered to customers in preparation for summer. With this centenary campaign, Rani Plast wants to highlight the importance of agriculture and industrial production in Finland’s past and present. For every campaign roll sold, the company donates a euro to the Mannerheim League for Child Welfare. This also inspired the campaign name, “A Hundred Cents, a Hundred Years “. The campaign stretch film was sold in batches containing both blue and white rolls. This is an opportunity for farmers to get creative and use their wrapped bales for making patterns of anything they like in their fields – maybe a Finnish flag. The blue and white bales will also be the subject of a photography competition this spring, organised in cooperation with Rautakesko.